Using monotype as a primary mark making technique this 5 day workshop focuses on the use of many plates and collage elements to create richly layered compositions. Rather than trying to compose on just one surface you will learn how to think in layers where many options become available in one or more impressions. 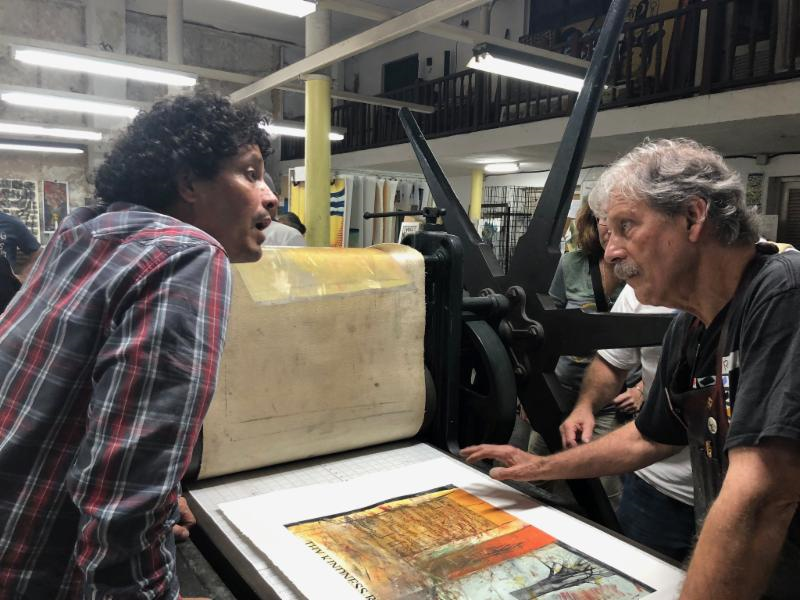 While a monotype plate is in progress you may decide to incorporate a background plate and perhaps a collage element or even an ImagOn or Solarplate. By having numerous surfaces to work from your options become endless and the mixing and matching of imagery has the potential to move you into very exciting new directions. This fully instructional workshop is suitable to all levels of experience and runs 9-5 each day with a lunch break. Additional open studio work time is included after instruction Monday- Thursday.